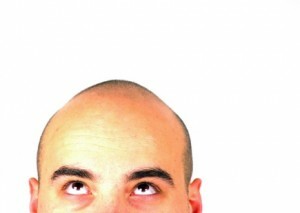 A new paper in PLoS Genetics describes discoveries related to the genetics of male pattern baldness, with substantial contributions from the 23andMe community. Led by Dr. Brent Richards of McGill University, the study combined genome-wide association data from seven cohorts, comparing men with “early onset” male pattern baldness with older men who had experienced little or no hair loss. The combined analysis allowed us to identify six new genetic factors associated with early onset baldness, in addition to replicating two previously known loci. 23andMe participants represented more than half of all the cases in the study — not that we have an unusual number of bald customers, it’s just that we’ve got lots of data! We also used additional data provided by 23andMe participants to show that a risk score based on genotypes at the eight associated loci was strongly predictive of whether someone would report early onset male pattern baldness or not.Two of the new loci are in or near histone deacetylase genes HDAC4 and HDAC9. Histone deacetylases regulate expression of other genes by modifying histones, which are proteins responsible for packaging our long strands of DNA into the tiny spaces within the middle of cells. One of the mechanisms cells use to regulate gene expression is to tightly bundle up and pack away the DNA of genes that should not be active, and to unpack and expose the DNA of genes that should be turned on. Both of these HDAC genes are thought to have roles in regulation of androgen hormone pathways, which are thought to play an important role in prostate cancer as well as male pattern baldness. Baldness and prostate cancer risk have been linked in several previous studies, and our new findings may help to explain these observations. Unexpectedly, we found that one of the newly associated loci — in a region of chromosome 17 — is also associated with Parkinson’s disease. 23andMe was uniquely positioned to further investigate this relationship, thanks to our existing Parkinson’s disease community, many of whom have also taken our hair loss survey. This particular genomic region is special because it is spanned by a large, common inversion polymorphism — a long stretch of DNA that is flipped end-to-end in many people. A consequence of this rearrangement is that genes in this region tend to be inherited together, and it is difficult to say whether the shared association is due to variation in a single gene that affects both conditions, or due to variation in two unrelated genes inherited together due to the inversion. We found that even after accounting for this shared association, that men were still more likely to report both male pattern baldness and Parkinson’s disease than would be expected by chance. This suggests that there may be additional shared genetic or environmental risk factors that predispose towards both conditions. This study gives a nice example of a kind of question — bringing together information about genetics and seemingly very distantly related phenotypes — that is relatively easy to ask using the 23andMe customer community but would be very difficult in a traditional genetic research setting. These are all complex conditions with many genetic and environmental factors at play, and just because you have one condition doesn’t necessarily mean you will develop the other conditions. But the idea that Parkinson’s disease and male pattern baldness may share some genetic factors highlights interesting avenues for research into the biology underlying these two very different conditions. Similarly, the link between prostate cancer and male pattern baldness has been suggested in the past, but our new findings provide hints at possible mechanisms.